Selection of most popular Rectus type quick couplings used in compressed air technology. Here you can browse quick couplings, air hose fittings, quick release connectors, pipe connectors, single shut-off quick connect couplers, and other kinds of couplings compatible with Rectus series 21, 26, 27 and 30. All products in this category are manufactured in EU, and are fully compatible with Rectus standard. 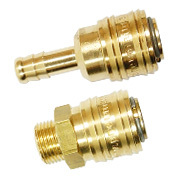 Couplings and connectors in this category are perfect for compressed air, but can also be used with other inert gases and can work with really high pressures - up to 35 bar. Depending on the series, couplings are made of various materials (different industry requirements), but important technical properties are similar. Since we are official distributor of those elements, we can offer you very competitive prices.